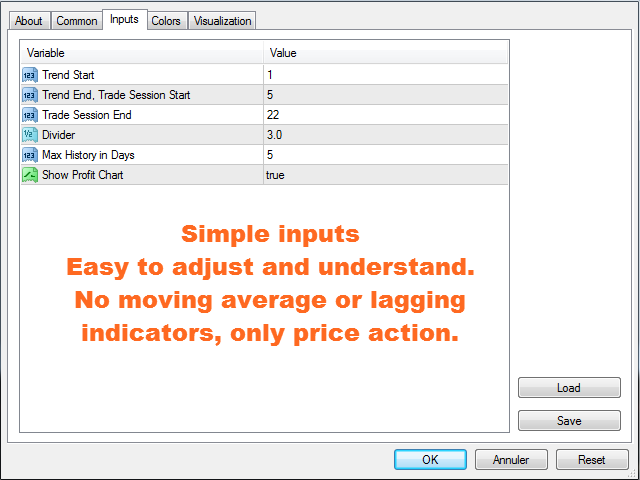 This indicator is part of the RPTrade Pro Solutions systems. 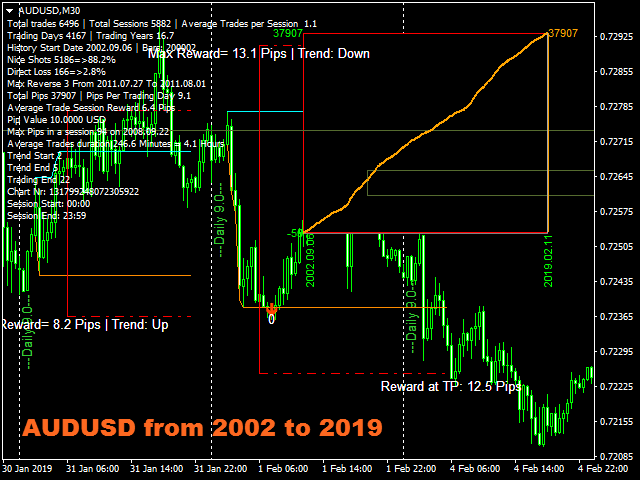 Breakout Pro Scalper Solution is a daily trend indicator using Price Action, Dynamic Support and Resistances. It's designed to be used by anyone, even the absolute beginner in trading can use it. Indications are given from close to close. Designed to be used alone, no other indicators are required. Gives you the trend and potential Take Profit at the beginning of the day. A specific graph shows you the potentiel profit according to history data. Breakout Pro Scalper Solution is using a breakout strategy combined with price action and dynamic Support and Resistances. The night trend and volatility are analyzed to be used during the next day. The "success" of the strategy and settings can be checked instantly thanks to the graph on the chart. The OnChart Graph allows to see immediately if there are any "holes" in the strategy and eventually select another TimeFrame or Symbol that would fit better. The red dash dot lines shows where to place the Take Profit and eventual Stop Loss. 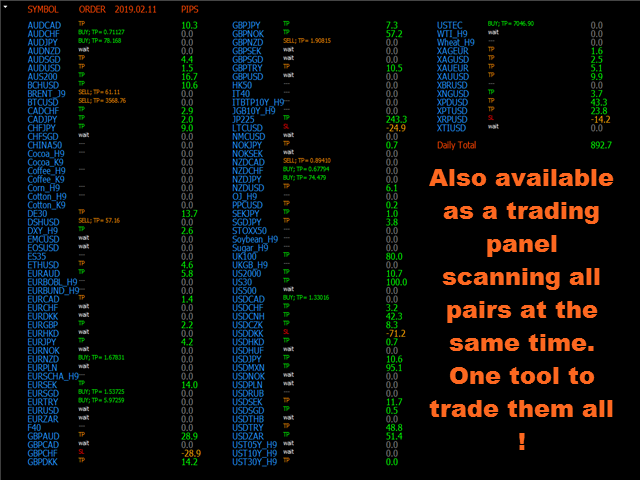 Trades are indicated one by one, there are never two trades at the same time. Most of the trades (80%) are finished during the day. Where to open your trades. Take Profit and Stop Loss. The potential quantity of pips that can be caught. With any instrument like FX pairs, indexes, metals, futures or any other if the quotations are supplied overnight. Reliable Buy / Sell signals. All notifications are very detailed and give also Take Profit, it allows to trade from a mobile device. 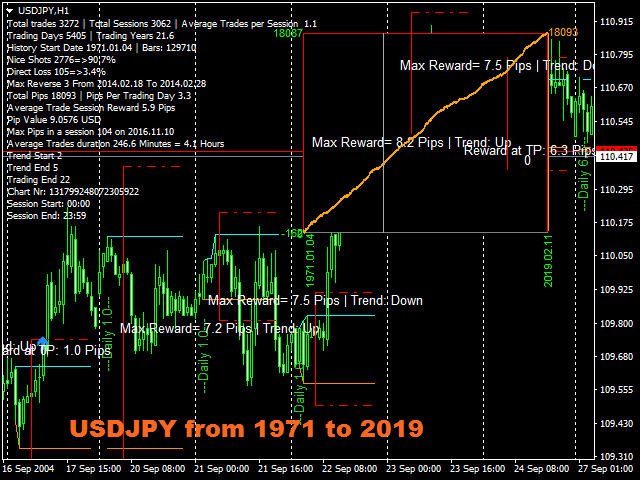 On Chart profit pips graph showing balance for the whole history data. It's easy to see if the strategy is consistent with the selected instrument. The On Chart graph is movable with the mouse, double click on it and move it to any convenient position on the screen. The Supports and Resistances re displayed on the chart. Level lines with thin and fat areas are displayed on the chart. Just put it on your chart(s). Simply follow the arrows and Take Profit / Stop Loss indications. Trend Start: [Integer] Enter here the time for the beginning of the night trend. Default value is 1 o'clock; it fits for most Fx pairs that are quoted from 0 to 23:59. 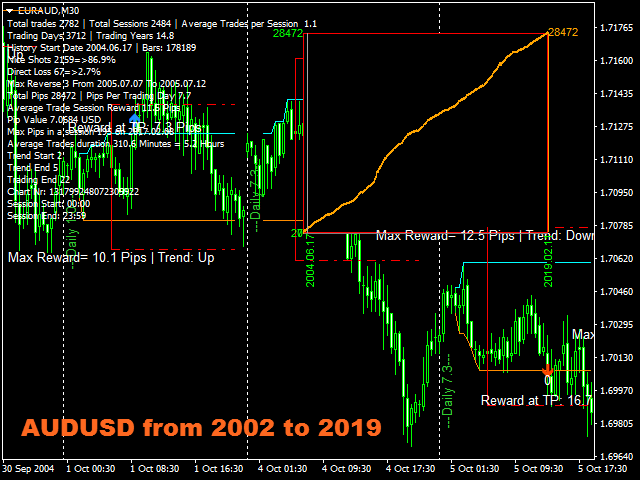 Trend End, Trade Session Start: [Integer] Enter here the time for the Ending of the night trend and beginning of the trade session. Default value fits most instruments. 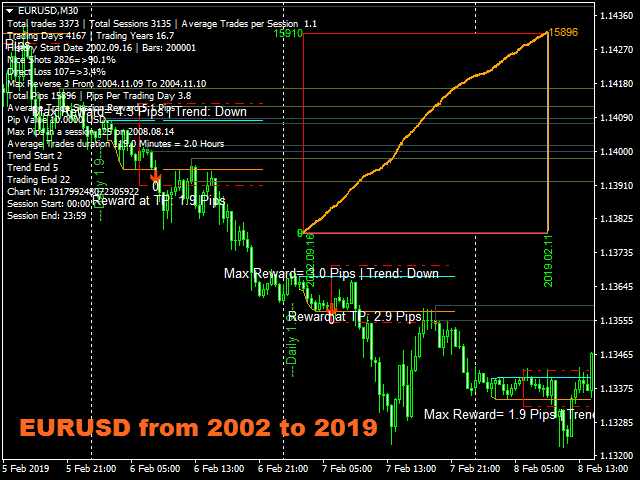 Trade Session End: [Integer] Will not show trades after this time. 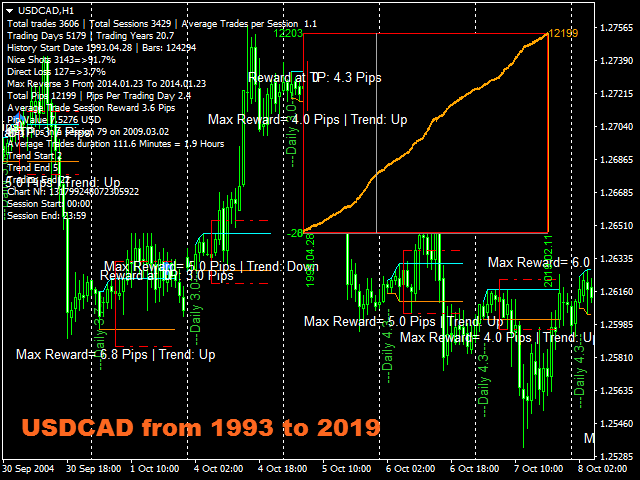 Divider: [Double] Divides the distance in between Trend Start and Trend End to calculate Take Profit and SL. Default is 3, means that TP and SL will be 1/3 of the night volatility distance. Max History in Days: [Integer] Sets history duration in days for the gray price lines. Show Profit Chart: [Bool] true = show the profit chart, false = don't show. Don't be in a hurry, the test is quite slow as it makes complicated calculations. Anyway you won't have to wait for long to see that the strategy is really profitable. A new release is to come soon. It will use directly Support and Resistances to adapt Take Profit, Stop Loss and filter trade start signals. A third one will use the price lines to "forecast" price movements. It will be possible to select and use the past strategies in the new releases.